Nationality: American. Born: Philadelphia, 27 September 1922. Education: Black Mountain College, North Carolina, 1947–48; studied at Universities of Perugia and Florence, 1949–50; trained for the stage with Michael Chekhov. Military Service: Enlisted in Army, 1943; joined Soldiers Show Company, Paris, 1945. Family: Married actress Peggy Maurer, 1955, one son, one daughter. Career: Assistant director on The Colgate Comedy Hour , 1951–52; TV director, from 1953, working on Gulf Playhouse: 1st Person (NBC), Philco Television Playhouse (NBC), and Playhouse 90 (CBS); directed first feature, The Left-handed Gun , 1958; director on Broadway, from 1958. Awards: Tony Award for stage version of The Miracle Worker; two Sylvania Awards. Address: c/o 2 West 67th Street, New York, NY 10023, U.S.A.
" Bonnie and Clyde : Private Morality and Public Violence," in Take One (Montreal), vol. 1, no. 6, 1967. "Arthur Penn at the Olympic Games," an interview in American Cinematographer (Los Angeles), November 1972. "L'Amerique qui change: entretien avec Arthur Penn," with P. Merenghetti, in Jeune Cinema , October/November 1990. Marchesini, Mauro, and Gaetano Stucchi, Cinque film di Arthur Penn , Turin, 1972. Cawelti, John, editor, Focus on Bonnie and Clyde , Englewood Cliffs, New Jersey, 1973. Carlini, Fabio, Arthur Penn , Milan, 1977. Zuker, Joel S., Arthur Penn: A Guide to References and Resources , Boston, 1980. Giannetti, Louis D., Masters of the American Cinema , Englewood Cliffs, New Jersey, 1981. Vernaglione, Paolo, Arthur Penn , Florence, 1988. Kindem, Gorham, The Live Television Generation of Hollywood Film Directors , Jefferson, North Carolina, and London, 1994. Gelmis, Joseph, "Arthur Penn," in The Film Director as Superstar , New York, 1970.
" Le Gaucher Issue" of Avant-Scène du Cinéma (Paris), November 1973. Byron, Stuart, and Terry Curtis Fox, "What Is a Western?," in Film Comment (New York), July/August 1976. "TV to Film: A History, a Map, and a Family Tree," in Monthly Film Bulletin (London), February 1983. Andrew, Geoff, " The Shootist ," in Time Out (London), 13 August 1986. Richards, P., "Arthur Penn: A One-Film Director?" in Film , October 1987. 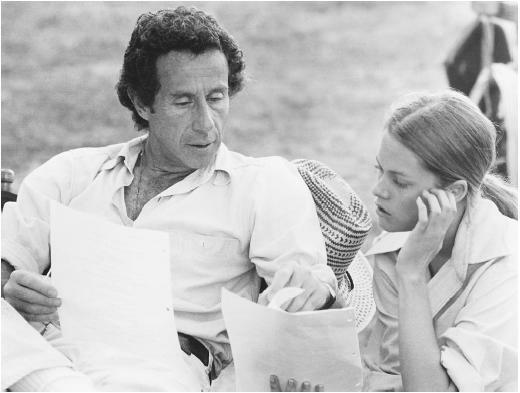 Arthur Penn has often been classed—along with Robert Altman, Bob Rafelson, and Francis Coppola—among the more "European" American directors. Stylistically, this is true enough. Penn's films, especially after Bonnie and Clyde , tend to be technically experimental, and episodic in structure; their narrative line is elliptical, under-mining audience expectations with abrupt shifts in mood and rhythm. Such features can be traced to the influence of the French New Wave, in particular the early films of François Truffaut and Jean-Luc Godard, which Penn greatly admired. As a focus for his perspective on America, Penn often chooses an outsider group and its relationship with mainstream society. The Indians in Little Big Man , the Barrow Gang in Bonnie and Clyde , the rustlers in The Missouri Breaks , the hippies in Alice's Restaurant , the outlaws in The Left-handed Gun , are all sympathetically presented as attractive and vital figures, preferable in many ways to the conventional society which rejects them. But ultimately they suffer defeat, being infected by the flawed values of that same society. "A society," Penn has commented, "has its mirror in its outcasts." An exceptionally intense, immediate physicality distinguishes Penn's work. Pain, in his films, unmistakably hurts , and tactile sensations are vividly communicated. Often, characters are conveyed primarily through their bodily actions: how they move, walk, hold themselves, or use their hands. Violence is a recurrent feature of his films—notably in The Chase, Bonnie and Clyde , and The Missouri Breaks —but it is seldom gratuitously introduced, and represents, in Penn's view, a deeply rooted element in the American character which has to be acknowledged. Penn established his reputation as a director with Bonnie and Clyde , one of the most significant and influential films of its decade. But since 1970 he has made only a handful of films, none of them successful at the box office. Night Moves and The Missouri Breaks , both poorly received on initial release, now rank among his most subtle and intriguing movies, and Four Friends , though uneven, remains constantly stimulating with its oblique, elliptical narrative structure. But since then Penn seems to have lost his way. Neither Target , a routine spy thriller, nor Dead of Winter , a reworking of Joseph H. Lewis's cult B-movie My Name Is Julia Ross , offered material worthy of his distinctive talents. Penn and Teller Get Killed , a spoof psycho-killer vehicle for the bad-taste illusionist team, got few showings outside the festival circuit. Among his few recent directorial works is The Portrait , a solidly crafted adaptation for television of Tina Rowe's Broadway hit, Painting Churches. "It's not that I've drifted away from film," Penn told Richard Combs in 1986. "I'm very drawn to film, but I'm not sure that film is drawn to me." Given the range, vitality, and sheer unpredictability of his earlier work, the estrangement is much to be regretted. HE IS WONDERFULL ..HE CHANGED MANNY THINGS IN ART AND LIFE .